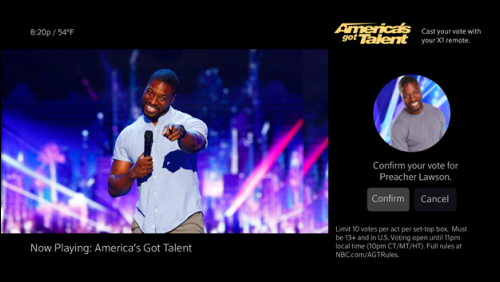 Starting tonight, and continuing through the next six weeks, Xfinity X1 customers will have the ability to vote for NBC’s America’s Got Talent directly from their TV Box. Say "Vote for AGT" or "Vote for America's Got Talent" into your X1 Voice Remote. Tune to the channel airing AGT. 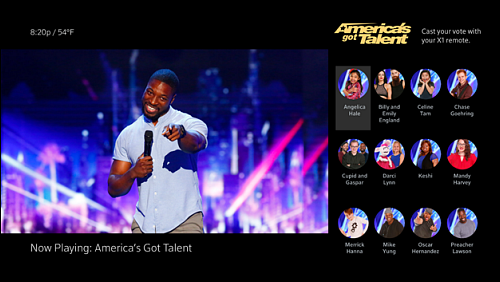 When "America’s Got Talent" pop-up messaging appears, select Info. 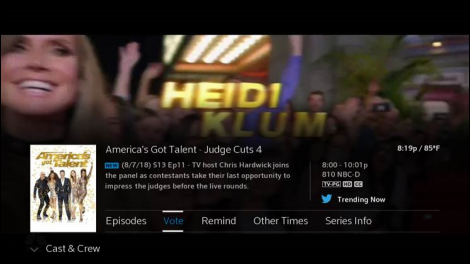 Tune to the channel airing AGT, then press Info on your X1 remote. On the menu that appears, select Vote. To vote, simply use the arrow buttons on your remote to select your favorite contestant, then select Confirm to cast your vote. Note: You will not be able to cast votes while accessing AGT via DVR or On Demand. Press Exit on the remote to return to full screen video. Press Info to bring up The Voice or AGT mini-info screen. If the Vote button is present, select it. If the Vote button is not present, retune to the station by going up a channel then back. Press Info on your remote to see if the Vote button appears. If the issue persists, you can still vote online at xfinity.com/voicevote for The Voice and xfinity.com/agtvote for AGT. You are only able to cast your vote on X1 while AGT is airing live. 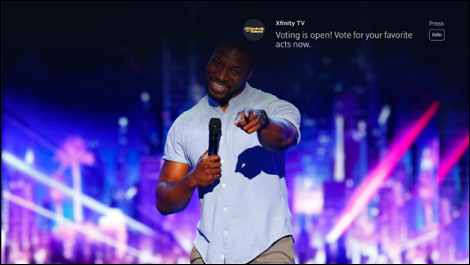 In the meantime, you can visit xfinity.com/agtvote to cast your vote, even after the live airing of the show has ended. Or, if you're like me and would rather not talk to your remote, just press the "i" button to bring up the voting screen. Note that voting ends one hour after the show ends where you live. Presumably, the ability to vote for any of the 12 acts before all of them have performed is nationwide; it is certainly allowed in the Pacific time zone. Also note that you can vote for multiple acts, and up to 10 votes per act (that's per act, not 10 total), but am I the only one that thinks that it doesn't make sense to cast 1-9 votes for an act - either you want it to continue, in which case you vote for it 10 times, or you don't, in which case you don't vote for it at all? Or, if you're like me and would rather not talk to your remote, just press the "i" button to bring up the voting screen. Thanks for that information. Generally, I don't talk to any devices other than a phone, and specifically to a person or voice mail on the other end.